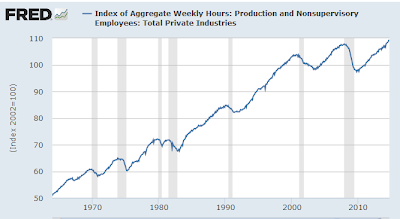 Inquiring minds may be interested in a set of charts that show trends in hours worked. The charts are as of the latest job numbers from Friday, October 3, 2014. 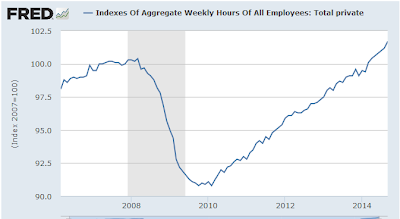 The index of aggregate weekly hours of all employees is at a new all-time high. 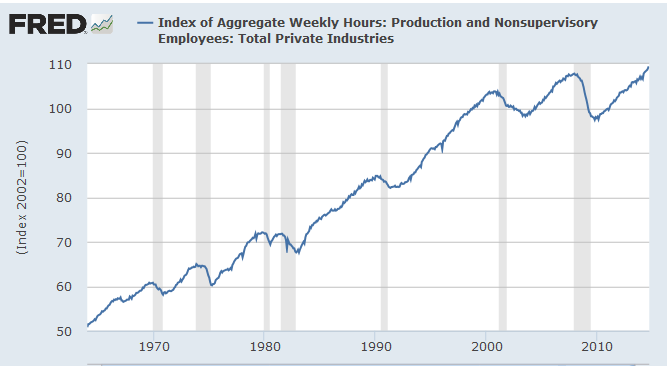 The data only goes back to 2007 so let's also take a look at hours worked by production and nonsupervisory employees. The indexes are formulated by multiplication of the number of employees by the average number of hours worked. So let's take a look at both sub-components. More people working but for how many hours? 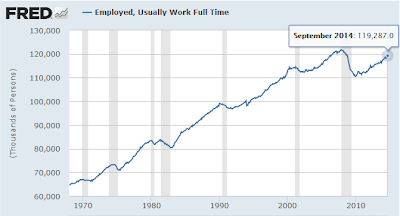 In November of 2007, there were 121,875,000 full time employees. Now there are 119,287,000. Fulltime employment is 2,588,000 below the 2007 peak. Meanwhile working age population, 16 and older has gone up from 232,939,000 to 248,446,000. That's an increase of 15,507,000. 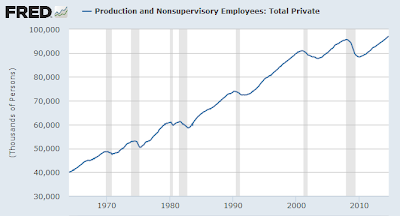 Simply put, the working-age population has gone up by approximately 15.5 million while fulltime employment has declined by 2.5 million. Some of this is related to boomer demographics and retirement. A lot of it isn't. It takes a detailed look at the number of people in each age group and how those age groups have shifted over time to normalize the data. Tim Wallace and I explored this idea once before, for the time period 2010-2013. For details, see Fed Study Shows Drop in Participation Rate Explained by Retirement; Let's Explore that Idea, in Depth and in Pictures. It's been nearly a year since that post, and with the job data seemingly booming, it's time for an update. I hope to have new graphs later this week or next, for the entire 2007-2014 period.